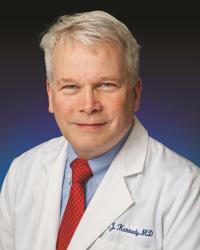 John J. Kennedy, MD is a board certified cardiologist who sees patients in the Annapolis and Kent Island offices, is an active member at Anne Arundel Medical Center and holds the position of Physician Manager for the Annapolis practice. His primary focus is evaluation of chest pain, arrhythmias, palpitations, fainting episodes and assessment of cardiac risk factors. Dr. Kennedy’s interests include coronary artery disease, preventive cardiology, atrial fibrillation, arrhythmias, hypertension, cholesterol disorders, cardiac murmurs and valve disorders, congestive heart failure, stress testing, echocardiography and nuclear cardiology. His care approach is to obtain all data needed to diagnose and treat cardiovascular disease , and to educate patients on their condition and management options. He works with his patients to develop the best treatment plan for their individual needs, with the goal of improving their quality of life and prognosis.